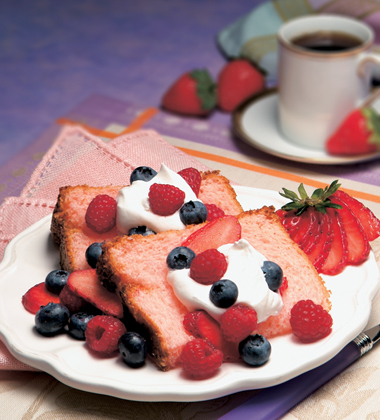 This rich and healthy berry dessert uses prepared cake mix and V8 Splash Diet to make it full of flavor but low on fat. angel food cake mix	 2 lb. 2. In a large bowl of a mixer equipped with a paddle attachment, combine cake mix and juice and mix on medium speed for 1 1/2 to 2 minutes until smooth. large muffin tins (8-10 oz) or large oven-to-table paper-lined muffin cups	 24 ea. 3. Line muffin tins or oven-proof cups with parchment liners and lightly spray with non-stick spray. If using cups, place on a sheetpan. 4. Pour 1/2 cup batter into each prepared cup. Bake individual cakes 18 minutes or until slightly browned on top and firm to touch. Remove from heat and cool slightly before removing from cake pans or cups to cool completely to room temperature. frozen mixed berries (blueberries, raspberries, strawberries)	 60 oz. 3 qt.